On Thursday mornings, I teach knitting as a volunteer at a psychiatric hospital. The facility’s bucolic setting and warmly decorated interior belie the struggles that these 13-17 year olds face: anxiety and depression, substance abuse, self-harming, eating disorders. The vigilant, caring staff does its best to provide a supportive home-like place for them to heal, but there’s no getting away from the fact that this is decidedly not home. This is a psychiatric hospital. I arrive just after the group has finished school to provide a pre-lunch activity. They are not required to knit, but they must at least sit with us in the cozy living room. I cherish my time with these lovely young people. They remind me that no matter what face we show to the world, each and every one of us is fragile and experiences pain. Their humor and perseverance in the shadow of some daunting issues centers and focuses me. I admire and respect every individual I’ve met, each with a unique personality and set of talents. The hospital purchases supplies, and my Tuesday knitting group graciously donated yarn and needles when I told them about my new endeavor, so we have large storage bins overflowing with a rainbow of possibilities. Often the young women and men show curiosity and interest, but reluctance, to try the new craft. “I don’t think I can do that. It looks so hard.” Knitting is decidedly awkward and frustrating at first. But as they sit and watch the more experienced residents, the novices come closer and start to ask questions, and I gently invite them to give it a try, and show them how to cast on and get the first row off the needle successfully. Endless Potential: There are so many colors and textures of yarn. Each project is a new beginning with the promise of a beautiful outcome. Even the same yarn will produce varying results on different needles and stitches. An adventure always awaits. 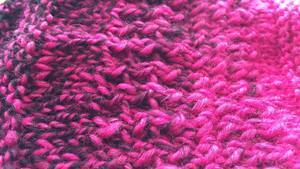 Reversible Errors: I always tell the group that that you just can’t mess up when it comes to knitting. There is no dropped stitch that we can’t pick up. No disastrous row that we can’t rip out. No uncorrectable mistakes. Even the most egregious blunders turn into disguised strokes of genius. One young lady knit a thick red scarf full of holes, dropped and added stitches, and knotted strands. She held it up, distraught. “It’s a hot mess!” But when we all scrutinized it, the mess morphed into a unique sculptural and architectural creation that none of us could have designed if we’d tried. It was truly stunning. Built-in Soothing: Once they get the motion – and admittedly that sometimes takes a while – the smooth, steady rhythm and gentle clicking of metal or bamboo needles calms as well as any meditation session. It quiets and clears the mind and cultivates a settling calm. Tangible Accomplishment: The group consistently comments on how satisfied they feel at seeing the results of their efforts so quickly. Even a few completed rows lend weight and substance to a piece. They can literally see it form before their eyes in a very short time. When so much of what they’re trying to achieve at this point in their lives may not come so easily, this is a lovely and immediate reward for their endeavors. They made scarves and hats as holiday gifts for family members, for themselves, and to donate to a local shelter for victims of domestic violence. The opportunity to teach this craft to these vulnerable young people brings me joy. I watch them completely engrossed in the work and hope that it takes their mind off the larger issues they’re there to deal with. I hope they feel as much pride in themselves as I feel when they pick up a set of needles to give this new skill a try. One resident – also a very talented painter with a wicked sense of humor – took to it quickly and churned out six or seven projects in the few weeks we had together. She eagerly showed me each newly completed creation, including a delicate cream-colored hat for her mother. If she only knew that she’d given me a great gift, too. The only downside of the experience for me is the double-edged sword of their discharge to go home or on to another therapeutic setting. I develop a rapport with each of them, even if they don’t ever knit. I keep a respectful and professional distance, careful not to invade their privacy. I have no idea what their individual issues are but see their vulnerabilities clearly and can easily sense when they’re more down or more up. It is with mixed emotions that I receive the good news of an upcoming discharge date, and I share honestly that I am happy for them, but will miss seeing them each week, and wish them luck. And then, mindful of their personal space and appropriate boundaries, I ask for permission to hug them. I’ve not been turned down yet, and these are some of the best, deepest, most genuine hugs I’ve ever had the honor to share in. Some tell me where they’re going; many say that they’ve already asked for knitting supplies to continue the practice at home. They list the projects they want to work on. I love that knitting has had some small part in their healing process, and hope that the habit and its positive effects stays with them long after they leave. Who knew that knitting could be so Zen, so encouraging a presence in the moment, so quieting for the mind? I did.